This article provides a walkthrough of the features and benefits of our repository for content ideas, the DivvyHQ Parking Lot. Have a great idea, but don’t know what you’re going to do with it? Park it! The DivvyHQ Parking Lot allows you and your team to have those moments of brilliance and capture them in a shared repository for future review. You can store them for a future content planning meeting, or until you have time to dig back in. To add an idea to your Parking Lot, add a new content item, fill in the required fields, then hit "Park It". 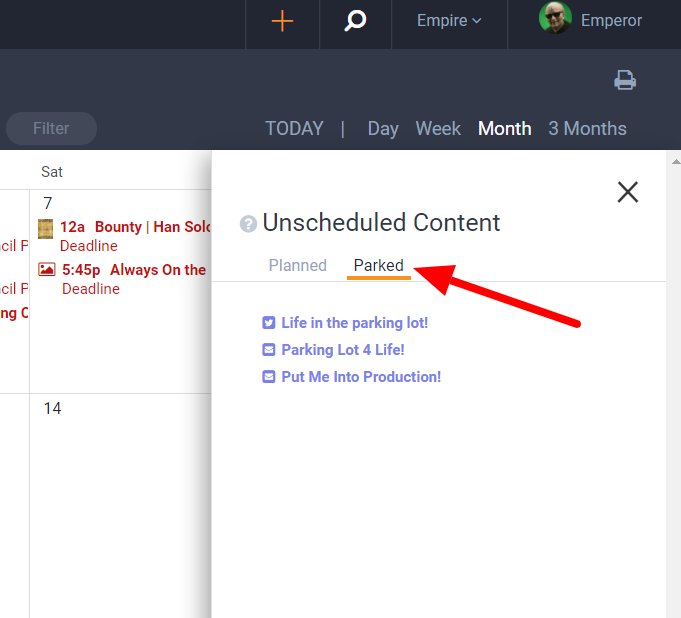 The layout and features of the Parking Lot mimics that of the DivvyHQ content interface, with a table-based list of content ideas that can be easily previewed, sorted and filtered. Here's a detailed list of all Parking Lot functionality. Click a content item row to bring up the Quick Edit overlay. Bulk actions allow users to bulk delete or bulk publish multiple content ideas at once. Edit your data columns to view your most important details. Sort or reorder your columns to create your ideal view. Click Edit to edit your idea in Divvy's content editor. Click Publish if you're a super-speedy overachiever and already published an idea. Need to export your ideas to share outside of Divvy? You can also access your Parking Lot content items via the calendar interface by clicking the Unscheduled Content Panel icon > Parked tab. 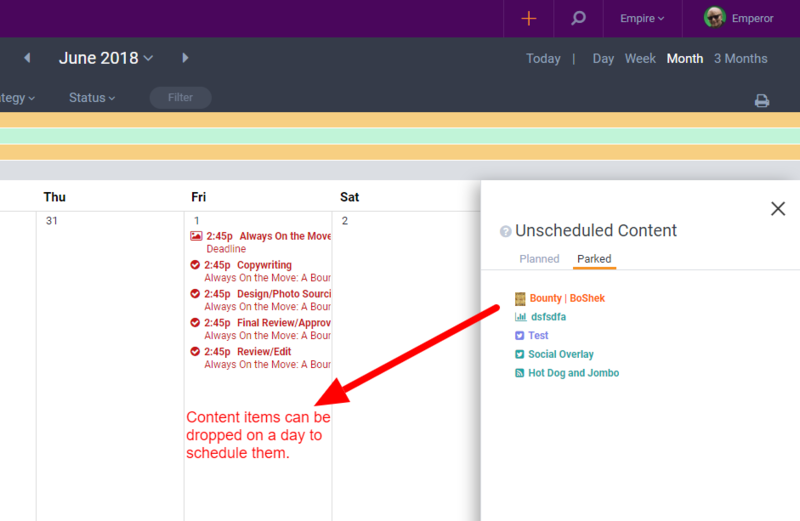 In the event that you're looking to fill a hole on your content calendar, you can simply drag and drop ideas from the Parked and Planned tab directly onto your calendar! To help make sure you are looking at the right ideas in the Unscheduled Content Panel, we display content in that view that matches your current calendar interface filters. That way you can make sure you are filling those holes in your content calendar with content that matches your needs (and current view).